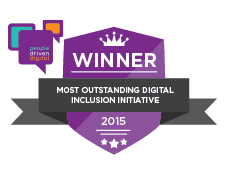 My Health Guide wins People Driven Digital unAwards 2015 – Maldaba Ltd.
What can we say? Well, we won! Friday evening turned out to be a delightful start to the weekend with the fabulous People Driven Digital unAwards 2015 in Leeds. We drank wine, met some brilliant innovators, and chatted about exciting projects in digital health. Then the serious stuff started, as Roy Lilley from The Academy of Fabulous NHS Stuff compered the formal part of the evening. 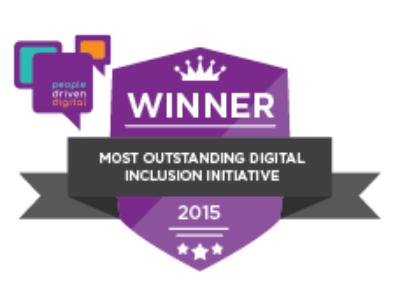 Before we knew it, Maldaba had been announced as the winner of the Most Outstanding Digital Inclusion Initiative category from a short-list of three finalists, and there we were, on stage, having our picture taken with Roy and The Tinder Foundation (who sponsored the category) as we received our award for My Health Guide. We were thrilled, and given the other finalists, a little overwhelmed. The support from the audience was humbling, which is fitting for a project where we’ve seen our technology really impact on the quality of life for the learning disabled adults who have worked with us to get this far. The rest of the evening passed in something of a blur. There were many congratulations and several exchanges of business cards accompanied by a beautifully festive atmosphere for all finalists and winners. One common theme throughout the evening is how collaborative so many of the projects were. They were either driven by patient-need, or (as was the case with My Health Guide) had patients and users at the core of the project and were developed with direction and input from those users. It was very heart-warming to be part of that crowd, and to listen to many of the evening’s inspiring speakers. Oh, and did I mention, that we won?!? !